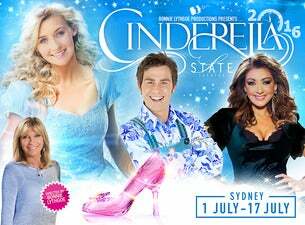 Next winter you shall go to the ball as Bonnie Lythgoe Productions, Australia’s biggest family musical panto producer, and the State Theatre Sydney, stage the most magical musical panto of them all, ‘Cinderella’. It will prove to be bigger and more spectacular than ever! ‘Cinderella’ is the ultimate winter feel good panto to charm audiences of all ages. This magical rags to riches story will feature sumptuous glittering sets, gorgeous fairytale costumes, fantastic song and dance numbers, infectious and riotous comedy magic and bags of audience participation. Fun and laughter is guaranteed for the whole family! Will Cinderella meet the man of her dreams? Will Prince Charming win our heroine’s heart? Or will the Ugly Sisters stop Cinders from going to the ball? All will be revealed next July, in the spectacular panto, ‘Cinderella’. Tickets to enjoy Sydney’s breathtaking magical family musical panto extravaganza are on sale now. Oh yes they are!!! With morning, afternoon and evening performances and fantastic rates for groups and children, don’t be a pumpkin! – Come and have a ball! You'll be utterly charmed! The clock is ticking – so book your tickets now! Early booking is advised otherwise not even your Fairy Godmother will be able to get you a ticket!